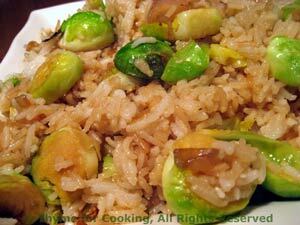 Fried Rice with Brussels Sprouts, add chicken for main course, Thyme for Cooking. You may think it a strange combination, but I have Brussels Sprouts. They are small, easy to use and I don't have Chinese Cabbage. The flavor is similar and the result delicious. Toast sesame seeds if needed. Trim Brussels sprouts, removing any damaged or discolored leaves and slicing off the root end. Set sprout on root end and cut into 3 or 4 slices. Heat oils in large nonstick skillet over medium heat. Add sprouts, shallots, and sauté until sprouts are crisp tender, turning once. Turn the heat up to medium high and add rice, soy sauce and sherry. Stir well to combine. Stir-fry for 3 - 5 minutes. Sprinkle with sesame seeds, stir once or twice and serve. To toast sesame seeds: Put them into a dry, nonstick skillet over medium heat. Toss or stir them about in the pan until lightly golden, about 5 minutes.